An elegant presentation of a classic, these Bride & Groom Caramel Apples will be a wonderful addition to your event. 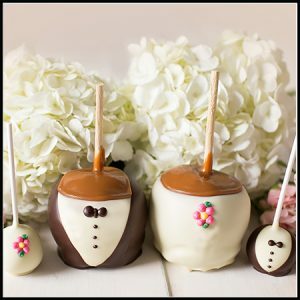 Large granny smith apples dipped in our homemade caramel and then covered in their respective chocolates are fun, yummy, and quite the crowd-pleaser. 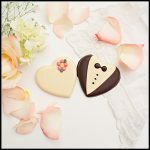 The Bride is dipped in white chocolate and then decorated with a hand piped flower, which can be matched to your décor. 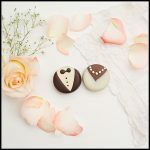 The Groom is dipped first in white and then again in a dark chocolate tuxedo with hand piped buttons and an adorable bow tie. 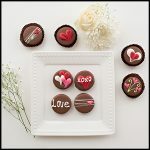 Each is then placed in a clear cello bag and ribboned to your specifications. Your favors will be the talk of the reception! 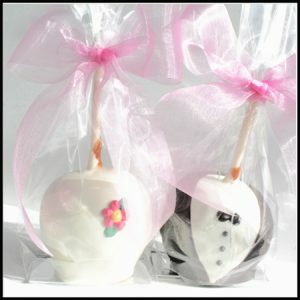 $7.98 each for either a bride or a groom.